On the Friday after Ash Wednesday we had to do our grocery shopping for the week. I’d let each of the kids get a free cookie from the bakery but abstained myself. As I was checking out I watched Ben and Anthony and Sophie slowly nibbling their cookies. I wish I had as much hunger for you, O Lord, as I do for one of those cookies right now. Thinking about almsgiving. I feel disconnected from giving money since I don’t earn any money. I know technically all the money Dom makes is ours not his, but still I feel disconnected. So I’ve been struggling the last few years how to make almsgiving meaningful. It occurred to me that giving of my time and attention to those closest to me might be the most productive kind of almsgiving. Putting my own tasks and desires on hold so that when I’m asked for something I don’t say, just a minute and put them off and off, but instead give up my desire to be comfortable, jump up and help the crying child, assist the one who is asking for my attention and my help. Of course, this is so very hard to do. If the idea of “giving up” is completely overwhelming, just decide to choose small mortifications throughout the day. So instead of “I give up all sugar”, when a dessert or sugar is in front of you, delay the instant gratification. Wait 15 minutes. And then wait 15 minutes more. Each time offer that as a gift to God. Don’t feel guilty if you do eat it. You’ve already offered two gifts of mortifications. Much to ponder here. This really struck me. How often I fail in my resolution. But here is something that’s not all or nothing like “giving x up for Lent.” It sees even the small delays as a form of mortification. So I’ve been trying to put it into practice. I haven’t given up Facebook altogether, but I have been trying to make myself wait and read a chapter of one of my books or pray the divine office before hopping online. I haven’t given up sweets, but I’ve been working at trying to delay gratification and seeing on a day by day basis if I can deny myself a cookie at the store, a piece of chocolate when I’m craving a treat, etc. And you know it’s working as often as not. I can put off having my dessert until later, waiting, telling myself: not now, not yet. Though I wasn’t so good at self control around the blueberry scones I made the other day. Oops. What is most consoling is that even if I fall many times a day, God wants me to pick myself up and go to Him, my Loving Father, and ask forgiveness and the grace to try again. I will be the Prodigal Son for thousands of times a day! We went to a beautiful Mass on the first Sunday of Lent at the Daughters of St Paul convent chapel with two of my favorite priests celebrating a Mass to which they’d invited several other families in addition to ours. After Mass time for coffee and donuts and chatting with friends and then a brief time for recollection, adults, teens, and children each having their own separate presentations. During ours Fr Harrington recounted an anecdote about Pope Francis, preaching to a group of priests in Rome asking them how they ended their days with God or with the television. A rather convicting question. Once I get the kids in bed I usually want to flop down and watch a show with Dom, surf the internet a bit. 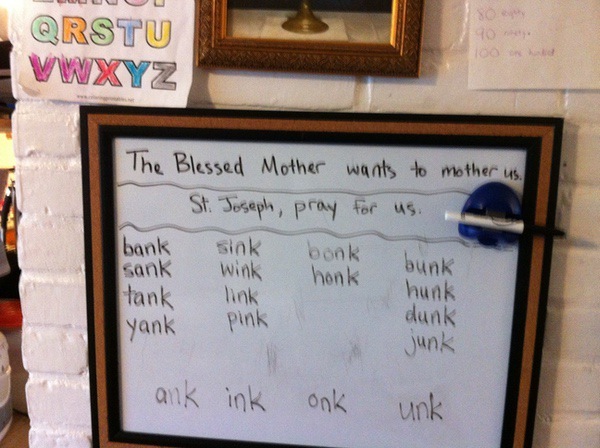 I try to say my bedtime prayers after doing that, though. Somehow it’s easier to focus after I’ve done my unwinding. But it does mean that sometimes I’m really tired because I put off the praying until really late. The girls and I have been reading a Lenten meditation a day from a book called Bringing Lent Home with St. Therese of Lisieux . They’re really enjoying it and it’s been great at sparking discussions and I hope that it’s inspiring them too. Each day’s reflection ends with a sentence we’re supposed to be carrying with us through the day. I’ve been writing them up on the white board and adding a little illustration. 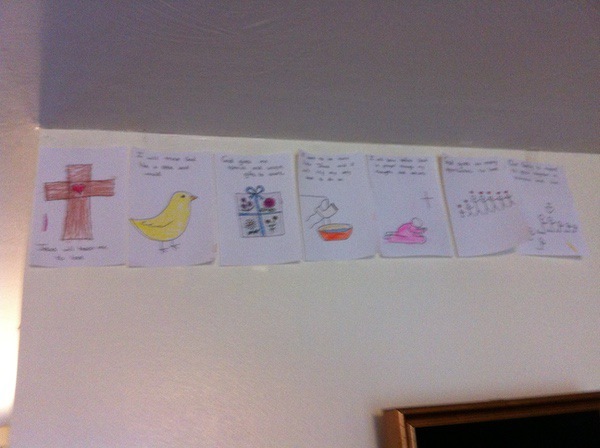 Bella didn’t want to erase them, though, so I copied the sentences and pictures onto little slips of paper, let the girls color the pictures, and then hung them on the wall. As you can see, I haven’t done one every day. We’ve missed a few days here and there, but I’m determined that I’m not going to let missed days make me give up the book! You are too sweet! I’m glad you found it helpful. I have been using the “delayed” gratification so many times! I’m definitely a very weak vessel, so my seemingly little goals are still so huge. Oh it has been very helpful. I tend to be very all or nothing and so it is very useful for me to have a plan for what to do when I “fail”. The idea that it’s not a failure but a victory if I achieve even a little delay is helpful in taking a more moderate, incremental approach. And thus in making progress instead of giving up.